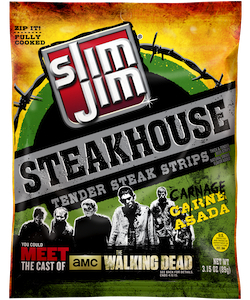 The Slim Jim Smokehouse line is the company’s foray into beef jerky and Slim Jim is working with The Walking Dead to recreate their Carne Asada flavor addition to the Smokehouse line. Carnage Asada – the pet name given to this product provides some inclination for the flavor profile that purchasers will experience period. The meat quality that is used in the Slim Jim Smokehouse line is good and the beef jerky itself is soft and chewy rather than being an exercise in futility to gnaw on and ultimately get down one’s gullet. The carne asada flavor blend is present and noticeable but it is not overwhelming – the specific array of flavors specific as interesting with hints of sweet, smoky, and pepper elements with each subsequent bite. This recast product line addition for Slim Jim do much to refresh the brand and give more than enough reason for those that are familiar with the traditional Slim Jim beef sticks to purchase a bag of the Smokehouse jerky. With the level of success that the company has had in regards to the Carne Asada flavor I would venture that the company will release additional flavors to the smokehouse line through the entirety of 2015 and beyond. If these newer varietals approach the quality of the Carne Asada Smokehouse variety than I will be sure to pick up a bag for myself.